Your shoulder may demonstrate problems of instability after an injury or a period of disuse. You may notice that your shoulder slips or feels unstable with certain activities. Often in these situations the most effective treatment is to restore the normal strength and coordination of the shoulder. The exercise program presented here can be helpful in optimizing the function of your shoulder. As with all exercise programs it important that these exercises be comfortable and that they be progressed gradually. Before beginning them you should consult with your physician. The first part of the exercise program is to do all you can to avoid having your shoulder "pop out of place." Even if it feels like it "needs" to be popped , don't do it. Each time you let it pop it makes it easier for it to happen the next time (just like blowing up a balloon repetitively makes it easier on each successive occasion). The second part of the reconditioning program concerns strengthening the muscles that press the ball of the shoulder into the socket. These muscles are called the rotator cuff muscles. 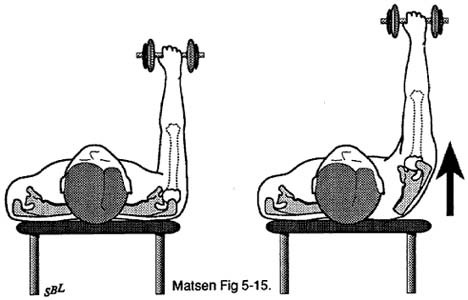 The rotator cuff muscles are strengthened by working against resistance in rotation internally (toward the body) and externally (away from the body). 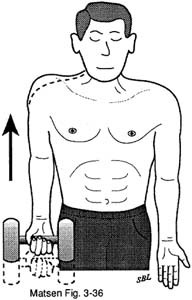 It is important that your shoulder have both strength and endurance of internal and external rotation. This means that you need to carry out at least five rotator cuff exercise sessions each day each taking only about five minutes. 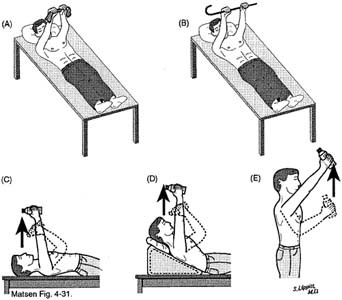 Examples of rotator cuff strengthening exercises can be seen in the images and videos below. The third component of the reconditioning program for your shoulder is to train the muscles that balance the ball in the socket. These muscles are primarily those which power your shoulder blade or scapula. When your scapula gets lazy or weak the shoulder tends to become malaligned and unstable. The purpose of these exercises is to strengthen the muscles and to eliminate bad habits that your shoulder may have developed. The scapular muscles are strengthened and trained as shown in the images and videos below. Regular fitness exercise helps keep your joints supple and coordinated. This "lubricating" effect is optimized if you perform a half-hour of aerobic exercise each day. This exercise may take a variety of forms including brisk walking, jogging, riding a stationary or mobile bicycle, rowing, climbing stairs, or using a cross-country skiing simulator. If you have concerns about your ability to carry out such an exercise program you should consult your general physician. It is not important that these exercises be carried out vigorously. It is only important that in addition to the stretching program a half an hour of your day be devoted toward some form of aerobic exercise. A guideline for someone with a healthy heart lungs and blood pressure is to work up to 30 minutes of exercise at a target of two-thirds of his or her maximum heart rate. Your maximum heart rate is estimated by subtracting your age from 220. If you are over 35 and have not been exercising much or if you are not sure of your health you should consult your doctor before starting this aspect of the program. If you have any questions about your shoulder or the proper treatment let your doctor know. If you have difficulty keeping your shoulder stable try using the "training tape" technique. Have someone apply some tape to the back of your shoulder joint (from the shoulder blade to the back of the arm) while you have your arm elevated straight out to the side. This tape will tend to keep the shoulder blade and your arm lined up and stable while you bring the arm forward. Just like with training wheels on a bike once you have learned the technique of balance you can discard the training tape. As you gain strength and coordination try to carry out progressively more of your usual activities concentrating on keeping the ball of your shoulder in the socket. Avoid activities and positions that threaten your shoulder's stability while practicing those that you can perform with confidence. Swimming rowing and using cross country ski simulators are all good exercises for developing strength coordination and endurance. They also have the advantage of exercising both shoulders at the same time. Persistent regular sessions of these exercises are essential for success. One cannot say that "exercises don't help" unless you have adhered to a quality program for at least six months. Please keep a daily log of your exercise sessions so your doctor can review it when you return to the office. regaining the technique and confidence in normal use of your shoulder. Remember that the shoulders of many athletes such as gymnasts are quite lax yet are stabilized by excellent muscle strength and learned techniques of neuromuscular control. Only exercises and training can reestablish proper use of your shoulder.